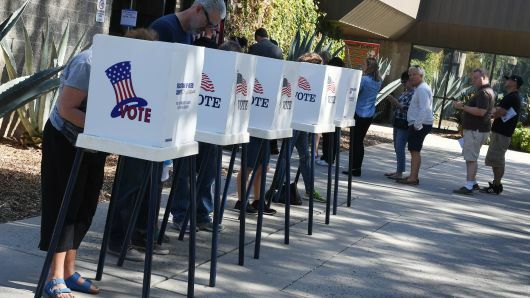 The midterm elections are upon us, and major news sources including MSNBC and Fox News have announced their official broadcasting schedules. Voter turnout this year has risen significantly, and live broadcast viewership is likely to rise this year as well. ABC Chief Anchor George Stephanopoulos will start coverage from the ABC News Election Headquarters in Manhattan beginning at 8pm ET. Reporters from ABC News will also be spread throughout the country covering the biggest elections of the night. CBS’ Norah O’Donnell, Jeff Glor, Gayle King, John Dickerson, and Bianna Golodryga will lead coverage from 9-11pm ET. General CBS coverage begins at 8pm ET. Lester Holt, Chuck Todd, and Savannah Guthrie will lead NBC’s coverage while Brian Williams and Rachel Maddow will lead MSNBC beginning at 6pm ET. Both NBC News and MSNBC will be in Rockefeller center in New York City, where there will be a virtual map over the skating rink announcing each winner. Judy Woodruff will anchor PBS NewsHour coverage starting at 8pm ET. CNN will begin at 5pm ET with Wolf Blitzer, Anderson Cooper, and Jake Tapper. And, for Fox News, Bret Baier and Martha MacCallum will begin coverage at 6pm ET. Additionally, PBS NewsHour will also stream on Facebook, Twitter, YouTube, and Ustream and coverage will be available on the 24/7 live stream, CBS Radio, and CBSNews.com. CNN will also be streamed live on CNN.com, CNNgo, and on mobile devices. Fox News will provide updates every fifteen minutes on SiriusXM Channel 115 and FoxNews.com will be providing a livestream. Snapchat is getting in on election night coverage throughout the night beginning at 6pm ET. Check here for more information on election night coverage here.